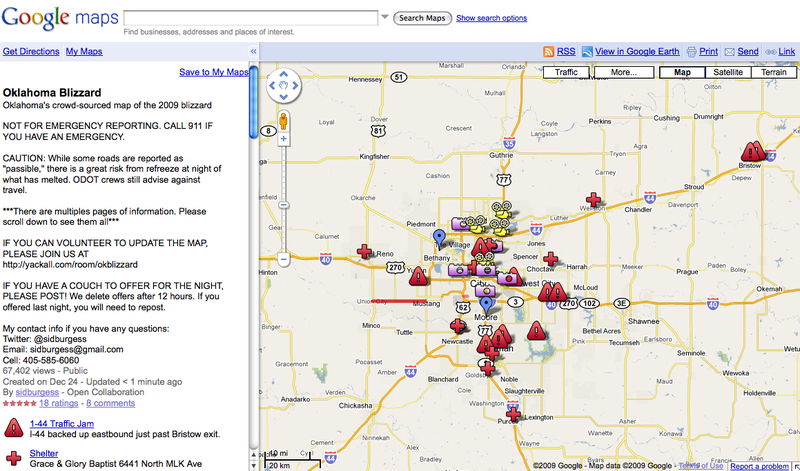 Can I Get Zip Code 20 Mile Radius Bulk Upload Targeting In Google Adwords? Instead, I have to hand code in the Zip Codes I want to target one at a time because the Adwords bulk upload feature automagically converts a Zip Code list into the nearest city’s coordinates. While on the surface this may appear helpful even intuitive, its not. 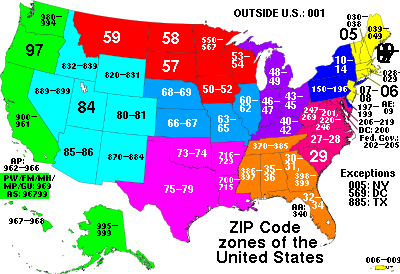 If I wanted to target the respective cities, I would enter their specific names not interior Zip Codes! 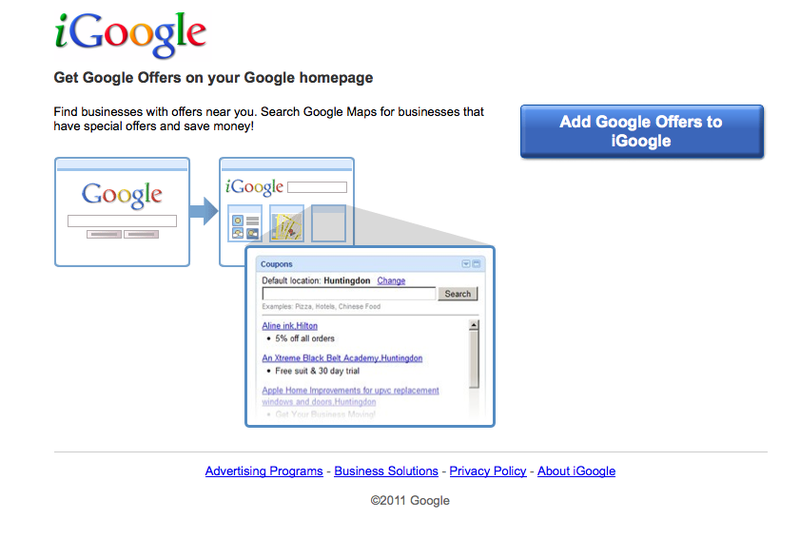 To this day, I still don’t understand why Google Adwords doesn’t provide pre-loaded Google Maps based Zip Code targeting. 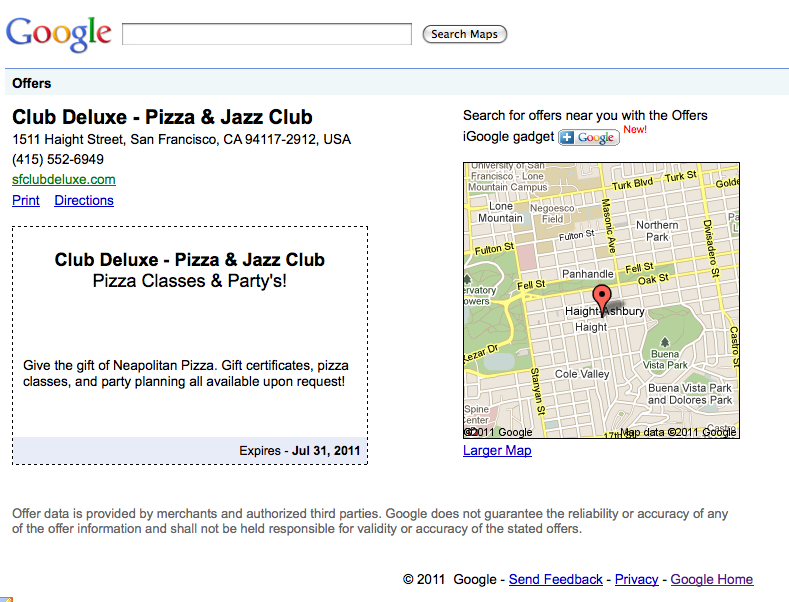 Its not like the smart folks at Google couldn’t figure out how to integrate Zip Code targeting into Google Adwords. 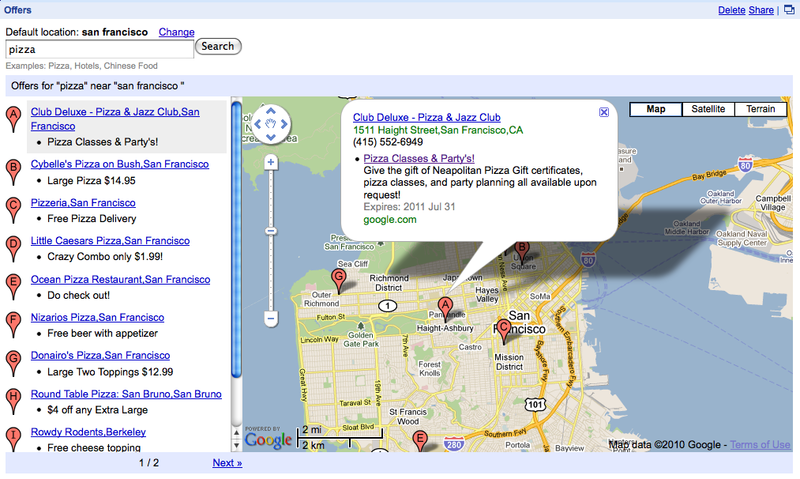 Once activated within an iGoogle homepage, the gadget automatically detects location with your permission or you can enter another location of your choice. Entering a search term in the Google Offers gadget produces a list of merchants from within the selected area who have created offers in their Google Places account. 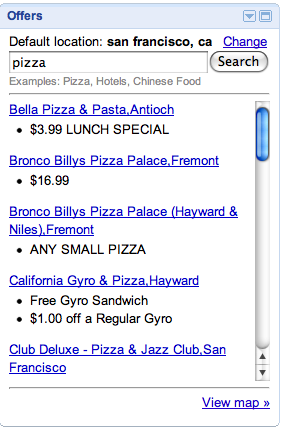 Clicking the “View map” option takes gadget users to a Google Map to view the location of available offers. 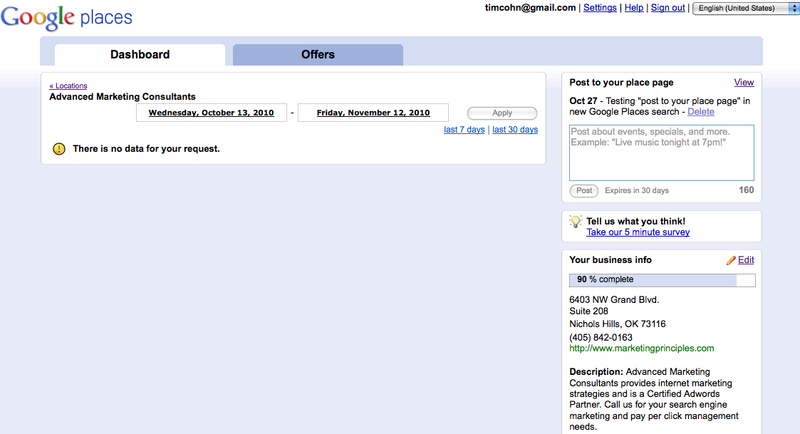 or the advertiser’s Google offer page where they can then print out the advertiser’s offer. I expect to see further Google offer development and distribution options like those found in the Google Offers gadget in the near future. 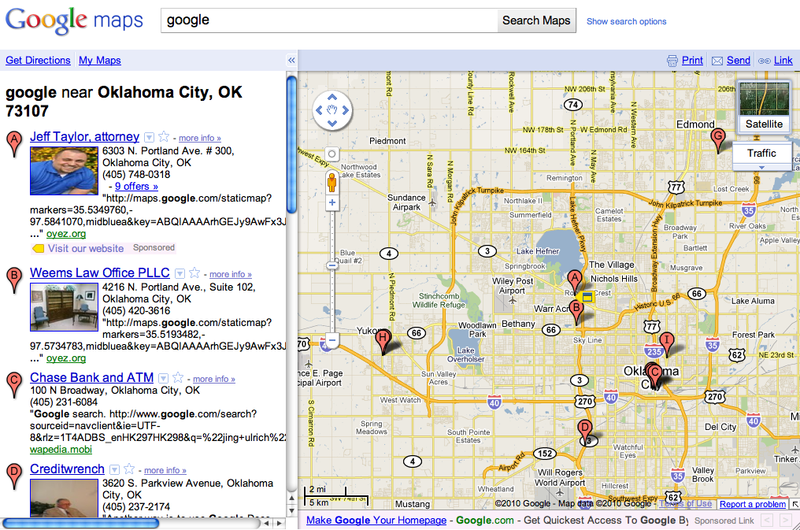 I thought the following three pack of Google Places results was unusual but also quite instructive. While there isn’t anything unusual about seeing Google Maps results appear in a list of local results within Google, I hadn’t ever seen anything other than Google Maps results there before. 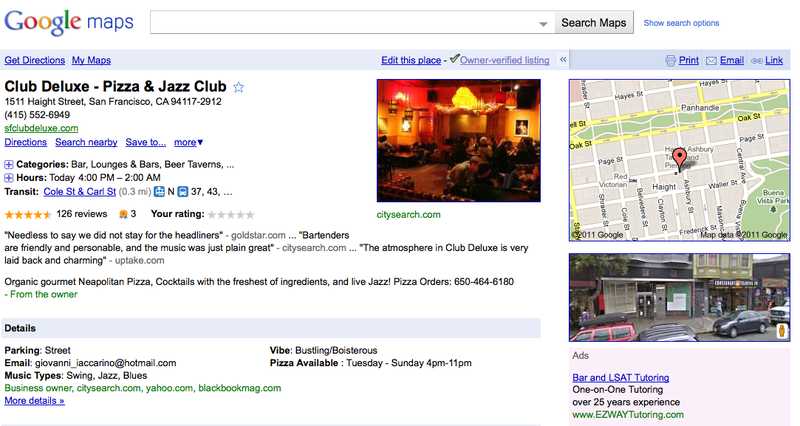 I think presenting a Facebook page as part of the “Places” results is new. In this particular example, the business owner has both a Facebook page and a Google Places page that appear in the results. 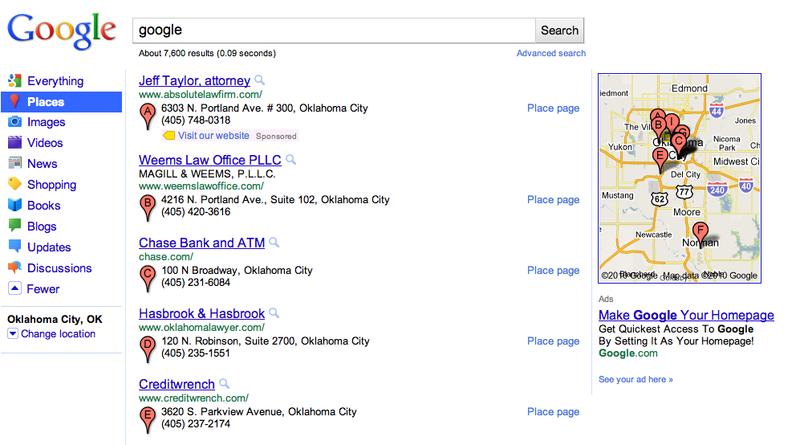 It looks like Google might have had to crawl the business owner’s Google Places page first to generate the Facebook link and result in the Google three pack. Regardless of which came first – the Google Place account or the Facebook business page – the marketing possibilities for the yet as unlisted or unsearchable business are exciting. If having a Facebook business page alone is enough to get listed in Google Places results, what is keeping all the small businesses without websites or directory listings from instead setting up a Facebook business listing and linking it to a Google Places account? Since I have visited both my Google Maps and Google Places listings several times over the last month, I can only surmise Google Places Analytics isn’t yet operational regardless of where it gets data from. With the recent launch of Google Places, I have become more interested in learning what is any differences exist between Places and Google’s other local search engine property – Google Maps. While I am still in the research phase, I have found one puzzling result in both Google Places and Google Maps – a search for “Google” itself. While Google Places and Google Maps use a searchers IP address or Google account to determine a searchers address and intent, neither property has yet figured out how to properly deliver the correct search results for “Google”. This same search result error occurred for several years in Google Maps and now seems to have made its way over to Google Places. 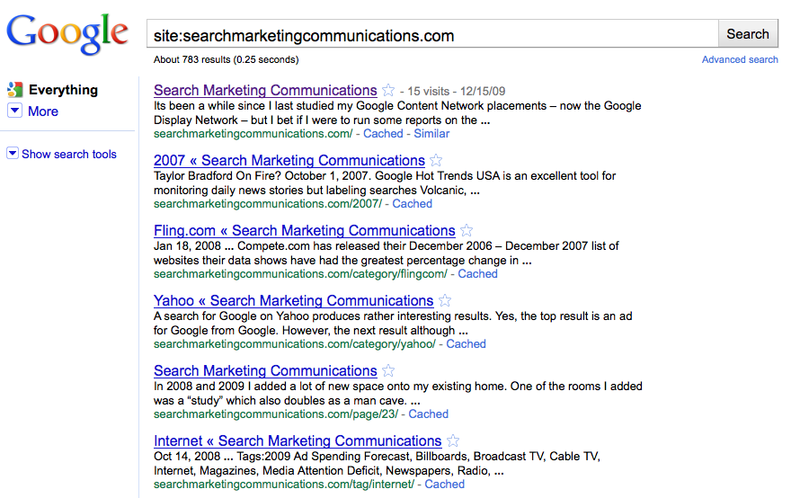 To Google’s credit, searching for Google directly from Google Maps doesn’t appear to produce this type of search result any longer. However, the errors do occur after searching on Google.com and then clicking the Places or Maps tab which Google apparently interprets as a new search for local results. 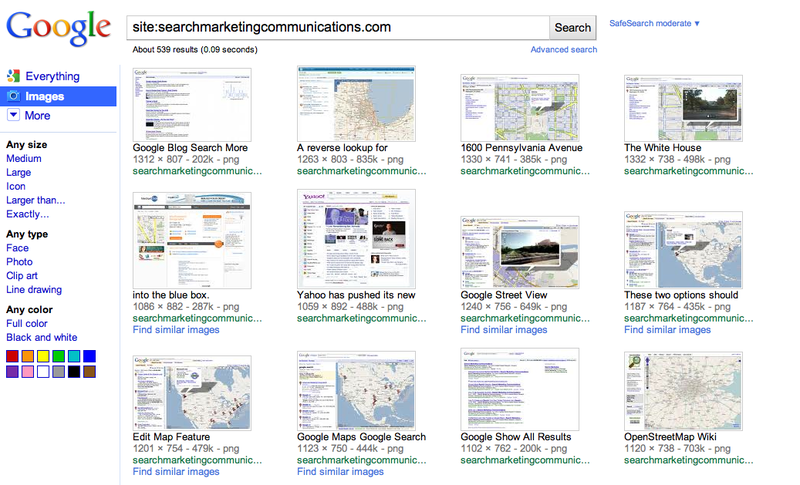 Regardless, I don’t think searchers or Google the brand are expecting these types of search results for the keyword Google in either Google Places or Google Maps. Do you get the same results in Google Places and Google Maps at your place or is this just a one off search results error? Sameer Samat, Director of Product Management, and Paul Lee, Business Product Manager, present “Global-Local Innovations” at a Think with Google summit. Their presentation encapsulates Google’s vision for Multi-Channel Marketing – to make finding where to buy a product near you as easy as finding it online via their product search, maps, ads and mobile search. 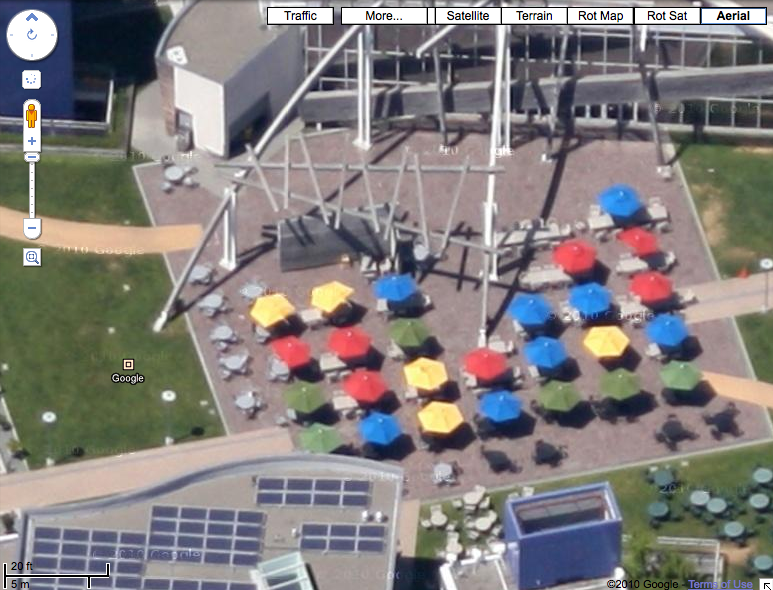 Google Maps has added several new Labs features like Aerial Imagery. 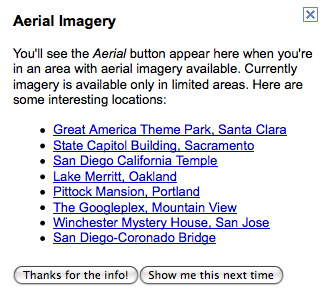 Although Aerial Imagery isn’t yet available for more than a handful of locations, Google implies more aerial imagery may be made available. 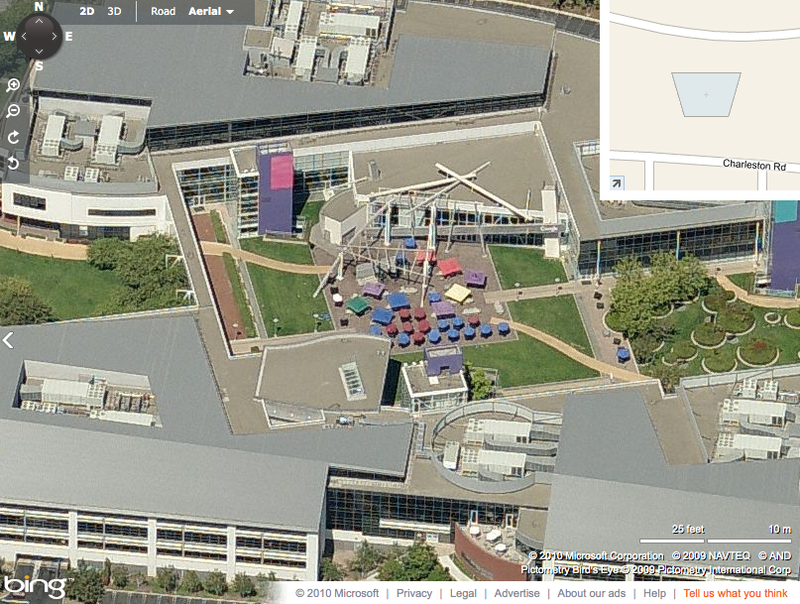 If you have ever wanted to get a bird’s eye view of the Googleplex in Mountain View, CA, Google Maps aerial imagery now provides it. 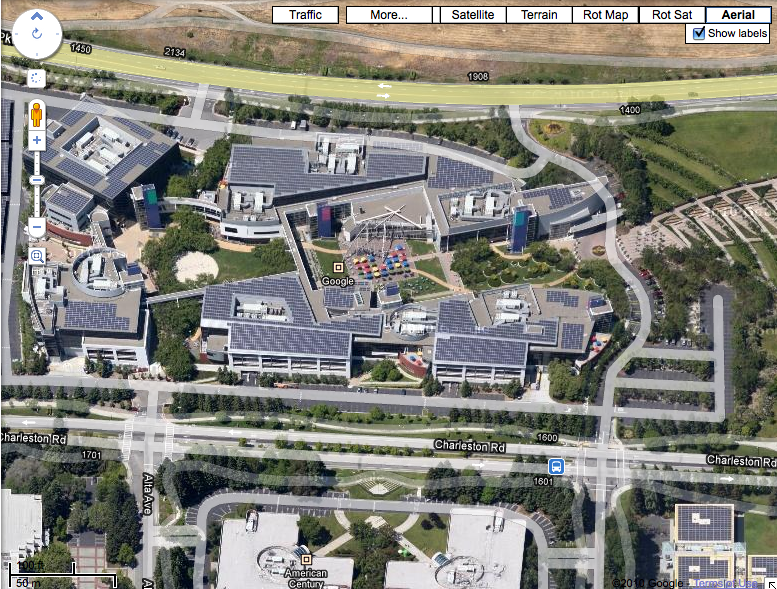 Google’s aerial image quality now appears to be on par with Bing’s Bird’s eye view image quality. However, Google’s aerial image viewer appears to let map users zoom in twice as close to a location as Bing’s Bird’s eye view. Anyone know where Google is getting these new images? If they are getting these images by airplane, won’t it take untold man hours to flesh out their image database? In 1959 Hawaii became the 50th state admitted to the union. 50 years later, Google has included Hawaii as the 50th state in their Street View in Google Maps. With Google’s imagery of Oahu and Maui, visitors can now take a virtual vacation to Hawaii’s white sandy beaches or plan their next trip. 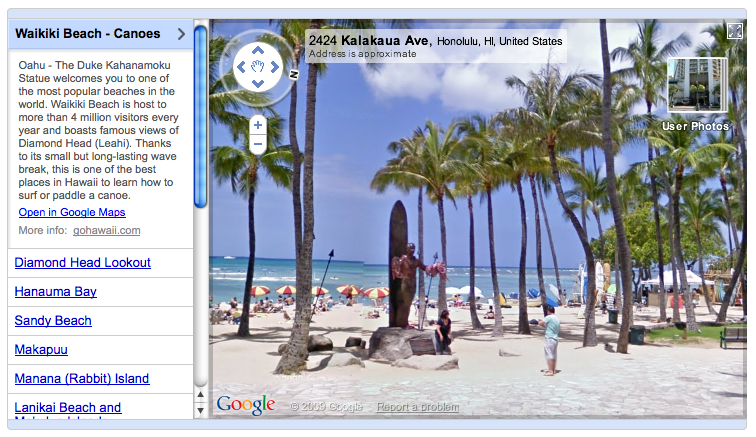 Take a virtual vacation to the beaches of Hawaii by visiting Google’s Street View Gallery.